For King & Empire — Canadian Documentary…. 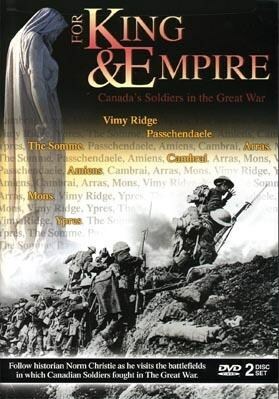 One of the better Canadian documentaries on the First World War is Norm Christie’s For King & Empire, that originally aired on the History Channel in 2001. Christie hosts each of the six, forty-five minute long episodes, walking over the modern-day battlefields in France and Belgium and charting the progress of the Canadians through the war. Christie is the publisher of CEF Books, which has singlehandedly brought many Canadian memoirs of the war back into print. He has also written many Canadian battlefield guides, and leads a yearly tour of battlefields in Europe. So, for your viewing pleasure, here is episode one: Ypres. If Youtube isn’t to your taste, this DVD series is available at both Amazon and nearly every Canadian public library. This entry was posted in Uncategorized and tagged Great War Documentaries, Norm Christie. Bookmark the permalink.